Brig. 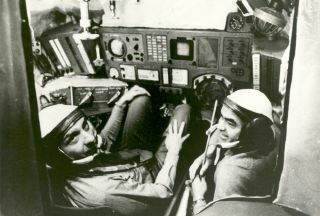 Gen. Stafford (left) "flew" the Soviet Soyuz simulator with Maj. Gen. Andriyan Nikolayev. In this historical photo from the U.S. space agency, Brig. Gen. Thomas P. Stafford (left), veteran of 3 US space flights, "flew" the Soviet Soyuz spacecraft simulator with Maj. Gen. Andriyan G. Nikolayev, veteran of two Soviet Space flights, during Stafford's visit to Moscow as part of a U.S. group working on the Apollo-Soyuz Test Project (ASTP), which launched July 15, 1975 amid the tense Cold War relations between the countries. During a visit to the Soviet cosmonaut center, Star City, on Dec. 14, 1972, Stafford performed several terminal phase rendezvous in the Soyuz simulator and docked with the Salyut space station. Stafford, Deputy Director of Flight Crew Operations at the Manned Spacecraft Center (MSC), flew on Gemini 6 and 9 and on Apollo 10 missions. General Nikolayev, who has visited MSC, flew in Space aboard Vostok 3 and Soyuz 9. His wife, Valentina Tereshkova, was the first woman to ever fly in space.